Numbers displays the Template Chooser window. Click the type of document you want to create in the list to the left. 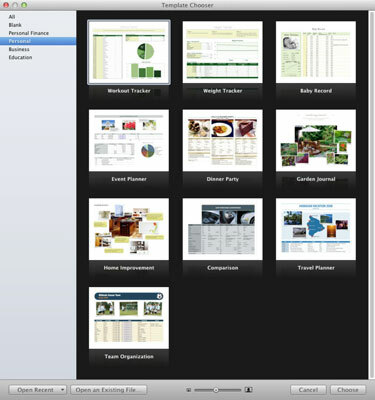 The document thumbnails on the right are updated with templates that match your choice. Click the template that most closely matches your needs. From Launchpad, click the Numbers icon to run the program. Press cmd+O to display the Open dialog. Click the desired drive in the Devices list at the left of the dialog and then click folders and subfolders to drill down until you’ve located the desired Numbers document. If you’re unsure of where the document is, click the Search box at the top-right corner of the Open dialog and type a portion of the document name or even a word or two of text it contains (using the pop-up menu that appears). Double-click the spreadsheet to load it. If you want to open a spreadsheet you’ve been working on over the last few days, choose File →Open Recent to display Numbers documents that you’ve worked with recently. The Template Chooser window also sports both an Open Recent button and an Open Existing File button. Convenience is A Good Thing! Click the Where pop-up menu and choose a location to save the file. If you choose a location other than iCloud, you can click a common location, such as your desktop, Documents folder, or Home folder. If the location you want isn’t listed in the Where pop-up menu, you can also click the down-arrow button next to the Save As text box to display the full Save As dialog. Click the desired drive in the Devices list and then click folders and subfolders to drill down until you reach the desired location. You can also create a new folder in the full Save As dialog. After you save a Numbers document for the first time, you can create a version of that document by choosing File→Save a Version. To revert the current document to an older version, choose File→Revert Document. You can choose to revert to the last saved version, or you can click Older Version to browse multiple versions of the document and choose one of those to revert to.